Description: Erect annual often over 1 m high with upper stems hairy. Leaves ovate, rhombic or elliptic, to 30 cm long, acute or obtuse; petiolate. Inflorescence terminal, dense. 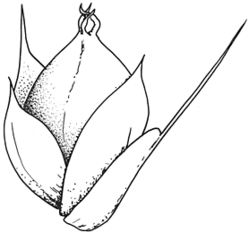 Bracts lanceolate, 2–3 mm long, spinescent. Perianth segments 5, oblong, 2–2.5 mm long, obtuse. Stamens 5. Ovary longer than the perianth, circumciss. Uncommon weed of closely settled areas, possibly as a contaminant of bird seed.